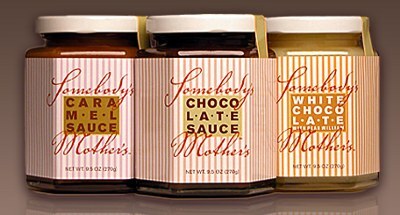 I recently reviewed Somebody’s Mother’s Chocolate Sauce over at our sister site, Snackerrific. When Somebody’s Mother sent two more smart little jars of her caramel and white chocolate varieties, the consensus around here was to share this sweet news with our loyal Candy Addicts. What comes to mind when you think about chocolate sauce? Perhaps thin dark liquids from a can or plastic bottle poured over ice cream or into a glass of milk and stirred vigorously? Well, cast those memories aside. Forever.